Apple's Macintosh OS X operating system is not based upon Mac OS 9; it is instead based upon the Berkeley Standard Distribution of UNIX, the Mach kernel, and the NeXTStep operating sytem libraries. In other words, it is really a NeXT operating system for Macintosh hardware. This is a good thing, especially for Unicode, but it does take some getting used to for those who find the old Macintosh look and feel familiar. To use Unicode polytonic Greek in OS X, first install a font according to the directions below. Next, install OmniWeb 4, which is available from the Omni Group website or your iDisk (at Software::Mac OS X Software::Applications::Internet Utilities::OmniWeb-4.0.5). (You may have to restart.) You should now be able to read Unicode polytonic Greek web pages that utilize precomposed characters. However, you may find pages utiziling combining diacriticals unreadable due to poor accent placement. At this time, the Internet Explorer browsers, Netscape 4.x, Netscape 6.x, and Netscape 7.0 do not provide usable support Unicode polytonic Greek in OS X. To use Unicode polytonic Greek in OS X, copy one of the Unicode TrueType fonts listed on the fonts page (like CODE2000) into the ~/Library/Fonts/ directory. (For you happy few who've never worked with a UNIX OS before, that tilde stands for your home directory - the folder that shows up in the finder window when you click the Home button. It usually has your user name as its name, and is actually /home/myusername/Library/Fonts/.) This will make the font available to you, but not to other users on your Mac (if you have multiple user names installed. To make a font usable by ALL users, you have to enable the root account and make the changes there. Note that you do NOT have to convert the font into a Macintosh font. Two browsers for OS X currently have support for Unicode polytonic Greek: Mozilla and OmniWeb. I would expect that there will be versions of Netscape (after Netscape 7.0) and Chimera (after 4.0), both of which are based upon Mozilla, with usable support for Unicode polytonic Greek. It is likely that there will be a future version of Opera for OS X with support for Unicode, including Unicode polytonic Greek. Mozilla versions for OS X after 1 September 2002 have slightly buggy, but readable support of Unicode polytonic Greek. Earlier versions (including Netscape 7.0 and Netscape 6.x, Chimera 0.4 and earlier, and other older Mozilla-derived browsers) have a severe bug which makes polytonic Greek effectively unreadable. The best choice for reading Unicode polytonic Greek webpages in OS X is OmniWeb. OmniWeb is a shareware web browser originally written for NeXTStep. The support for CSS and other, more recent web technologies in OmniWeb is often inferior to that in Mozilla; however, for most purposes, OmniWeb is a good alternative. For OS X 10.1, there is no easy way of typing Unicode polytonic Greek in OS X. Within Aqua (the windowing environment that 99% of users of OS X use), many applications do not yet have Unicode support (exceptions are listed below). There is a means of installing these fonts in OS X 10.1 if you have the developer tools CD, but it is neither easy nor reliable. Among the freeware keyboards available for OS X 10.1 is a keyboard created by Dr. Nick Nicholas. Mac OS X 10.2 (aka Jaguar), however, introduced easy keyboard installation. One merely needs to drop the keyboard *.rsrc file into the /Library/Keyboard Layouts (for all users) or /Home/username/Library/Keyboard Layouts folder, reboot the computer, and open the System Preferences International Settings pane to install a new keyboard. Chrisopher Blackwell of Fuhrman University has created one keyboard that works in this fashion, modeled after SGreek. There is also a keyboard/font package for OS X available at Ralph Hancock's Antioch site. But the most important package will undoubtedly be GreekKeys 2002: a Unicode version of GreekKeys for users of OS X 10.2. GreekKeys 2002 is a keyboard/font package designed as a replacement to GreekKeys for OS X users (and in particular OS X 10.2 users). You can read Unicode polytonic Greek emails with Mail.app, the email application that comes with OS X. 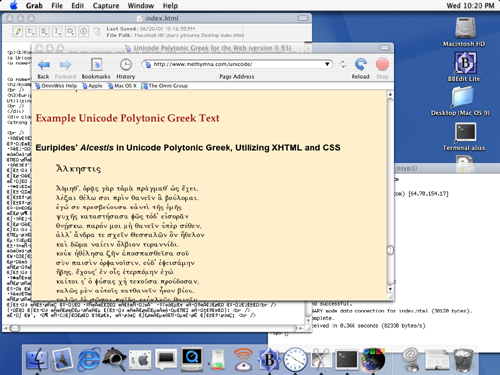 You can also read Unicode polytonic Greek text files in TextEdit, the text editor that comes free with OS X. While BBEdit, a text editor/programming editor for Macintosh (available for both Mac OS 9 and OS X), does provide Unicode support, it does not currently (as of version 6.5.3) support Unicode polytonic Greek in a usable fashion. Although Microsoft Word has excellent support for Unicode on the Microsoft Windows platform, there is no support for Unicode in Microsoft Word v.X for OS X. This leaves users of Unicode looking elsewhere for Office suite applications. Unfortunately, Apple Works (formerly Claris Works) also lacks Unicode support. The previous information on this page all refers to applications used in OS X in the Aqua environment. Because OS X is a Unix operating system, OS X can also run the X graphical user interface system (variously called X11, XFree86, X windows, etc. ), and there are already a number of packages available to install XFree86 on OS X, which can run either as an alternative to Aqua or within its own windows as Classic does (rootless X). However, adding X to OS X is not for the faint of heart; I would suggest garnering some experience with Linux before trying it out. If you are going to install X on OS X, I would suggest using the Fink system, which is available at SourceForge. Once you have installed Fink, follow the directions on the Fink website to install XFree86 4.x using the dselect Fink application. You should also install the Gnome and GTK libraries. You will also have to choose a window manager: the most popular window managers for X on OS X are Oroboros and BlackBox (both of which are somewhat reminiscent of NeXT). I have tested Enlightenment, the same window manager that I use under Linux; it is sometiems annoying on OS X. The Unix based program Yudit (see my Linux pages) does in fact support Unicode polytonic Greek and has a keyboard map for typing it. Reportedly, it can be run under OS X with XFree86 installed (thank you, David Chamberlain), as can a number of other relevant programs. Unfortunately, one cannot copy and paste between X applications and Aqua applications; so one must save Unicode documents from X applications and open them in Aqua applications. One can also install Amaya on OS X using X and the Lesstif libraries (Amaya requires the Motif libraries or a free equivalent; one reporter tested it with Lesstif). One will presumably be able to use Windows Unicode applications on a Mac OS X machine by running Virtual PC with an installation of Windows. Virtual PC is an emulation package which "translates" the PC-based data and processing that Windows uses to something the Macintosh can understand. It is likely that this would be much slower than running the same applications on a comparable Intel machine where Windows is the native operating system, or running native OS X applications without the Windows emulation. However, I have no reports regarding this method.